Donald Trump is reportedly planning to have a “star-studded” line-up at the Republican National Convention later this month. But one Republican has made clear that he won’t be one of them, and he's the former president of the United States. Why isn’t George W. Bush attending the convention? The 43rd president hasn’t said why he won't be there, only that he won't. Perhaps we shouldn’t be surprised, though, given that Bush hasn’t attended a Republican convention in over a decade. The last one he made an appearance at was the 2004 convention, and he had to be there to accept the party’s presidential nomination. But Bush Jr. skipped the 2008 convention, instead addressing attendees over video. And he didn’t appear at the 2012 convention at all. So really, Bush is simply perpetuating a long-standing tradition of his. What’s more, Bush isn’t the only prominent Republican who’s skipping the party's convention this year. Far from it: Some of the most notable names in GOP politics will be absent, including Marco Rubio, Mitt Romney, John McCain, Jeb Bush, George H.W. Bush, and more. John Kasich is an interesting case in that, while he will be in Cleveland doing convention-related events, he hasn’t yet said whether he’ll actually enter the convention hall. Most of these GOPers haven’t said precisely why they won’t be going to the convention, but in a few cases, the reason is fairly clear: Trump. Romney, for instance, has been one of the most vocal Trump critics in the Republican Party, having spoken at length on the dangers of a Trump presidency and at one point attempted to draft a third-party alternative for conservatives who aren’t on the Trump Train. Jeb Bush, too, is vehemently opposed to Trump and has said that he won’t endorse him. Given that the ostensible purpose of the convention is to formally nominate a presidential candidate, it makes sense that people who loathe that candidate wouldn’t show up. It’s also possible that some of the no-shows may not be personally opposed to Trump, but believe he's having a negative effect on the party and don’t want to be associated with his expected general election loss in November. 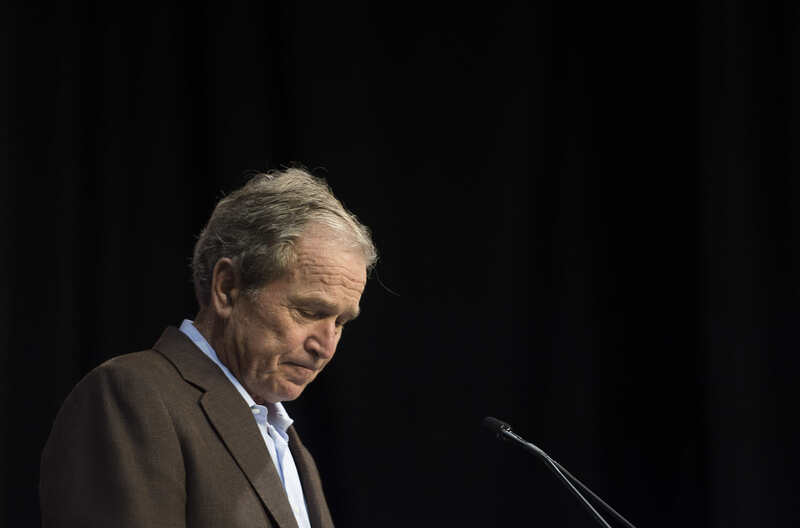 It’s unclear whether Trump is the reason for Bush’s absence. But it’s worth noting that Bush has been largely absent from the political scene since leaving office — and the convention is the most high-profile political event there is. Perhaps Bush doesn’t want to condone Trump’s candidacy. But it’s just as possible that he simply wants to lay low and enjoy his post-presidency life in peace.